Chengde, a famous historical and cultural city of China, was the second political and cultural center of the Qing Dynasty. It is 163 km to Beijing, and 210 km to Tianjin. 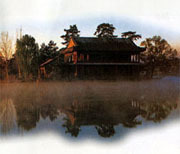 The Summer Resort is the largest ancient imperial garden in the world. The Eight Outer Temples-the largest imperial temple group in China, the magnificent Great Wall at Jinshanling, Mulanweichang-the famous imperial hunting ground, a vast expanse of the Weichang Forest Garden, and the Jingbei No.l Grassland in Fengning are all ideal tourist attractions for the ecological tour. In recent years Chengde has promoted many recreational projects, such as "Touring the Summer Resort at Night,""Qing Palace Banquet with Music and Dances, ""Light of Putuo,""Circling the Mountains of the Summer Resort," forest and grassland ecological tour, winter skiing tour, etc. The Chengde Tourist Festival, Forest and Grassland Holiday Festival and other activities are held in Chengde every year.